Malibu Gold Starry Night & The Del Sol Winner! I had this brilliant idea that I was going to play around with my Del Sol Trick-or-Treat polish again today, but of course it decided to rain all day today. My thought was to use it with some Konad plates, but that will have to wait until the sun decides to shine again. In the meantime, I painted my nails today with a $1.00 polish I picked up at a beauty supply in a town about 30 miles from here. This little beauty supply was not in the best part of town, and I really didn't think I came away with anything all that exciting--until I used this one for the first time today. 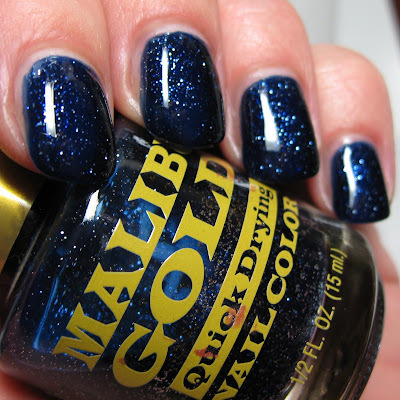 Malibu Gold Starry Night is possibly as close as I'll ever get to owning the other polish with a similar name. I don't know how close it actually is to Essie's Starry Starry Night, but I think it's beautiful. Above & Below: This deep inky cobalt shade is filled with tiny lighter blue foil glitter that twinkles and sparkles. The deep blue base has a jelly finish, which is always appealing to me. Note how the bottle comes complete with nail polish stains in another color! Isn't that a pretty shade? I used 2 coats, touching up the few bald areas before applying the second coat. This polish took a couple of minutes longer than normal to dry, but once it did, the finish looked like glass. All of the photos were taken with an Ott lamp, with the exception of the last photo which was taken with a flash. 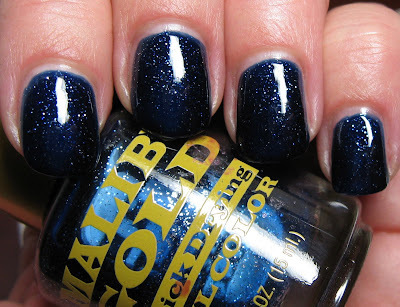 I found a little bit of information via Google on the company that manufacturers this polish, and it's called New Cal Development. I'm definitely going to be on the look out for more polishes from this company, and hope they have some others as nice as this one. The winner of Del Sol's Trick-or-Treat polish from yesterday's post is Jen! Congratulations to the winner, and many thanks to Del Sol for sponsoring the giveaway. That´s an awesome color!! Really love it! This colour is awesome, there's a lot of starry magic in this polish!! Thank you for sharing this with us. That polish s so gorgeous! 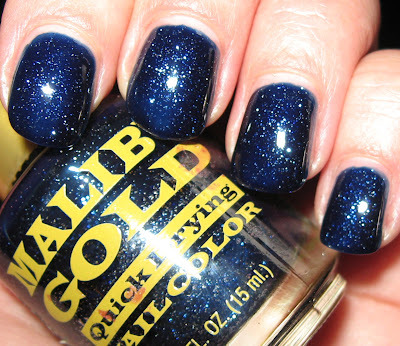 I wish starry blue glitter polishes were easier to obtain... I don't have SSN or any of the dupes! Congrats Jen! This is really pretty! I don't own the Essie polish either. Gorgeous! I don't have the Essie one either so I'm not sure what I'm missing but this looks great on you. Lovely color! Holy crow!!! That Malibu Gold is a fine find! I hope you can find some more and they are as divine as this one. That is gorgeous! I've never seen that brand before...what a find!